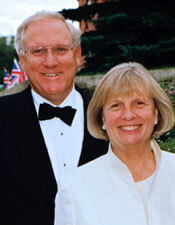 Northwestern trustee J. Landis Martin (left) and his wife, Sharon, recently made a $10 million donation to the NU School of Law. A Northwestern alumnus’s $10 million gift to the School of Law will help support and prepare graduates entering a profession in flux, Dean Daniel Rodriguez said Thursday. The University announced Tuesday that NU trustee J. Landis Martin (Kellogg ’68, Law ‘73) and his wife made their largest contribution yet to the law school almost 40 years after he made his first donation of $50 to its annual fund. “The law school had a profound impact on my career and my success in business,” Martin said. The money will help the School of Law retain an optimum class size, Dean Daniel Rodriguez said. He announced in March the law school will cut is class size by 10 percent in response to a decline in demand for law school graduates. The class reduction, which will take effect this fall, has led to financial strains as income from student tuition falls, Rodriguez said. He believes the donation will reduce the school’s reliance on tuition increases while keeping a healthy faculty-to-student ratio. “The more we bring outside support, the more we reduce pressure on the school and department from increasing student tuition,” Rodriguez said. Martin’s career in top positions it industries varied vastly from jobs traditionally associated with law, serving as an example of the diverse opportunities in the field, Rodriguez said. In addition to keeping a check on tuition increases, donations could support interdisciplinary ventures such as the JD-MBA program run by the Kellogg School of Management and School of Law. Martin said law at NU also applies to other interdisciplinary programs such as investigative journalism in the Medill School of Journalism, Media, Integrated Marketing Communications. “He believes the legal skills he learned at Northwestern University enabled him to prosper as a businessperson,” Rodriguez said. After working as a lawyer at the international law firm Kirkland & Ellis LLC for 15 years, Martin oversaw industrial, chemical and metal companies. As chairman and CEO of Titanium Metals Corporation, he managed what grew into a multibillion-dollar industry by negotiating with global titanium producers and selling metal to companies such as Boeing, Rolls-Royce and Precision Castparts Corp.
“I have a chance to run a Fortune 250 company, (and) that’s what I did,” Martin said. When he retired in 2005, Martin founded Platte River Equity, an investment firm based in Denver. He and his wife Sharon committed $15 million to NU’s fundraising campaign for athletics and recreation earlier this year. Martin said the gift to the law school had been about a year in the making. He said he has gotten to know former School of Law Dean David Van Zandt and Rodriguez as a member of the Law Board. “We have the happy dilemma of how best to use the proceeds over the course of the next several years,” Rodriguez said. Assistant summer editor Edward Cox can be reached at edwardcox2011@u.northwestern.edu. Follow him on Twitter at http://www.twitter.com/EdwardCox16.